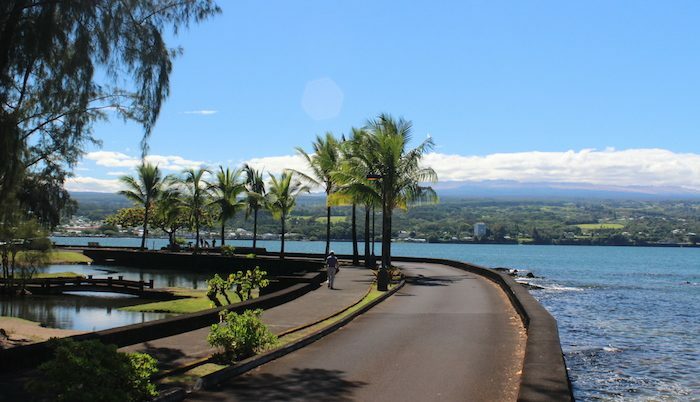 If you’re located near Hilo, on the eastern side of the island, the primo running spot is undoubtedly the beautiful Hilo bayfront. The starting point is Kamehameha Avenue, where you can run to the east past the canoe hale, fish market, then out to Liliuokalani Gardens. The run is along the road, combination of sidewalks, path, and ample shoulder. Just past the Gardens, continue on Banyan Drive, a nice shady loop under a stand of impressively huge Banyan Trees. Turning back towards the Bayfront will result in about 3-5 miles, and if you need a restroom or water break, you can stop at any one of the beach parks along the route.